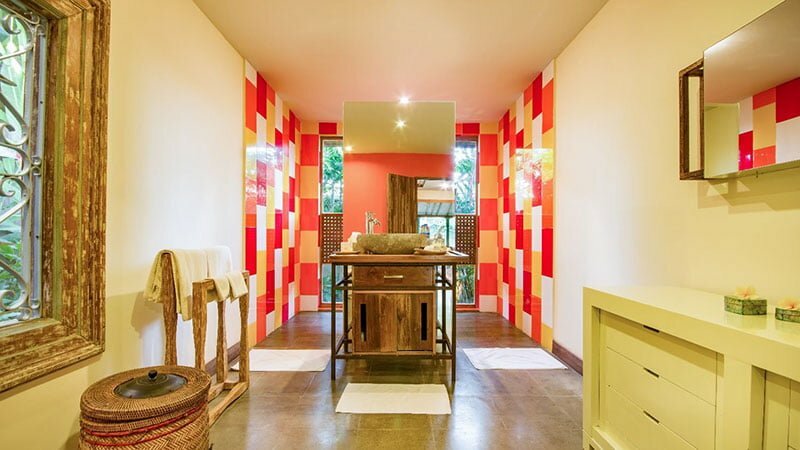 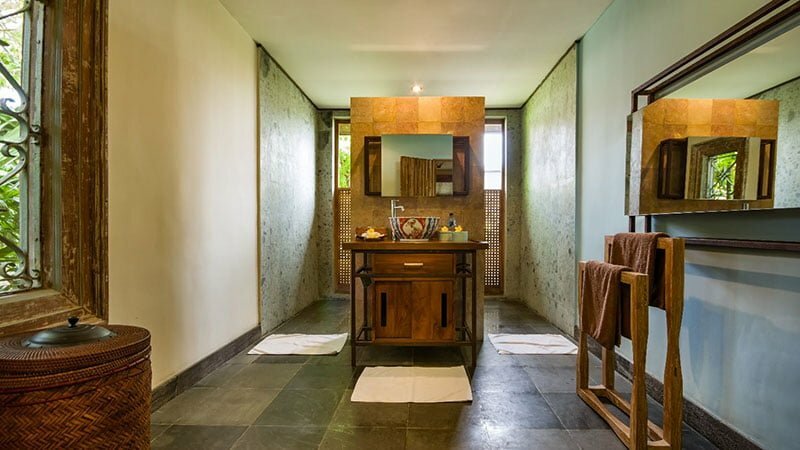 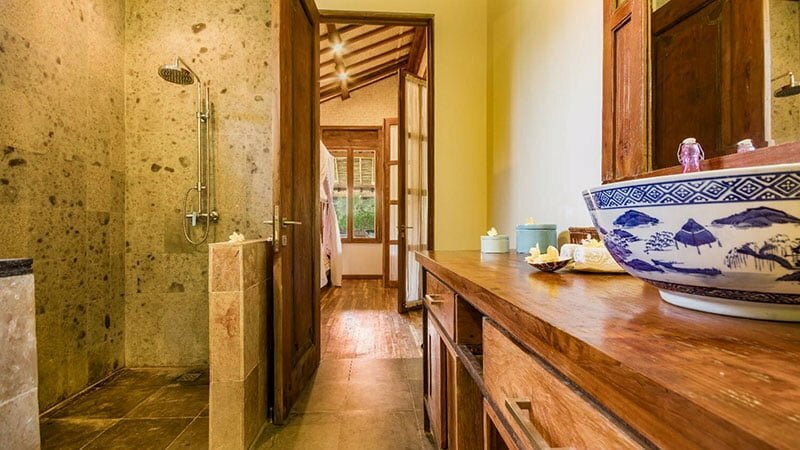 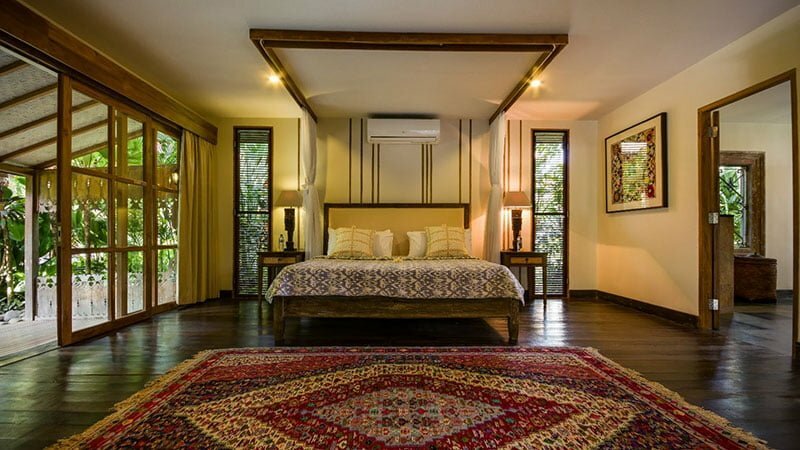 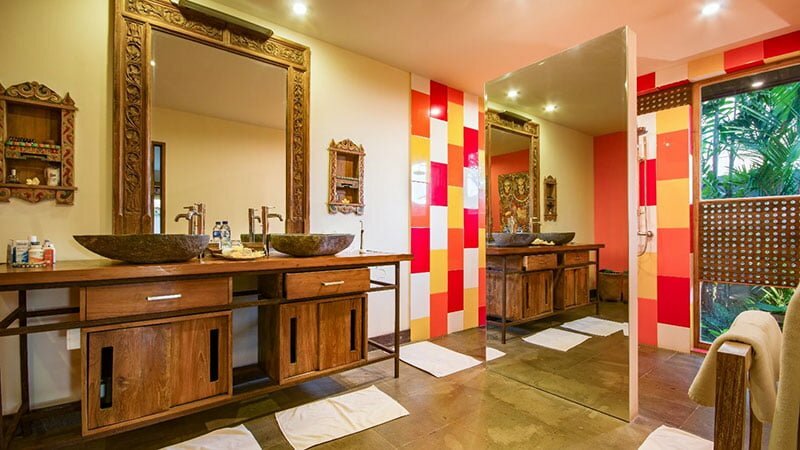 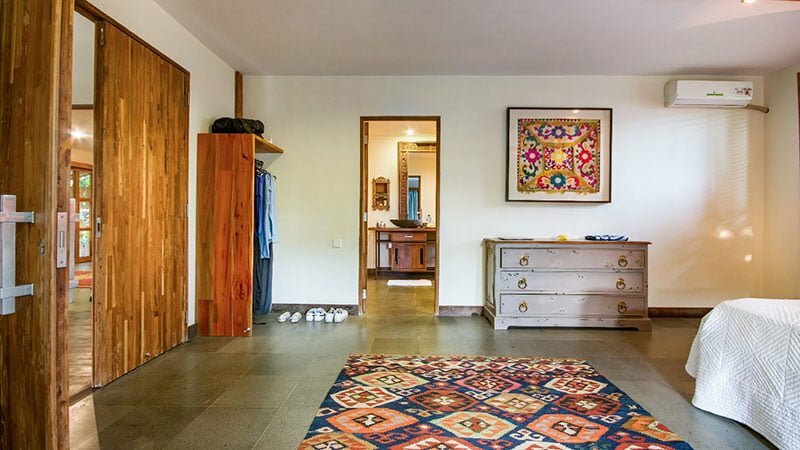 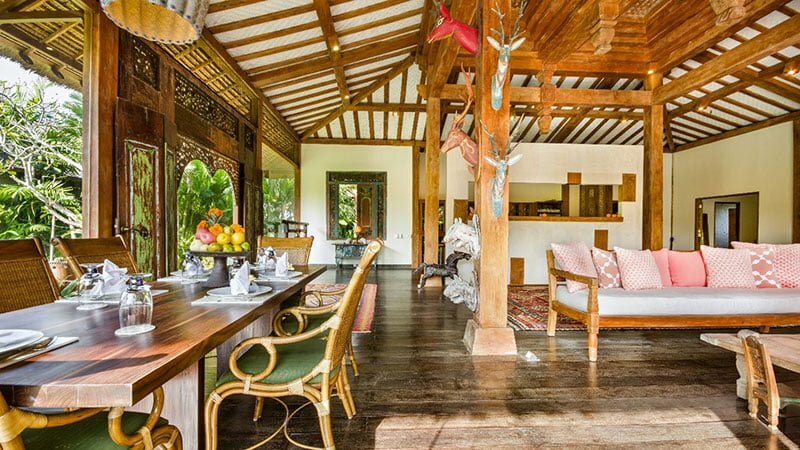 Villa Desa Roro is five-bedroom holiday home situated in a serene lane in Canggu. 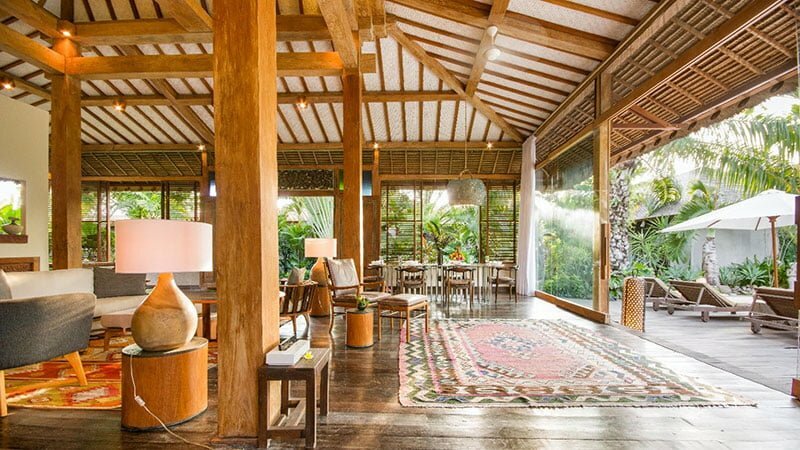 This resort has five pavilions, which house the living spaces, dining areas, and the five bedrooms. 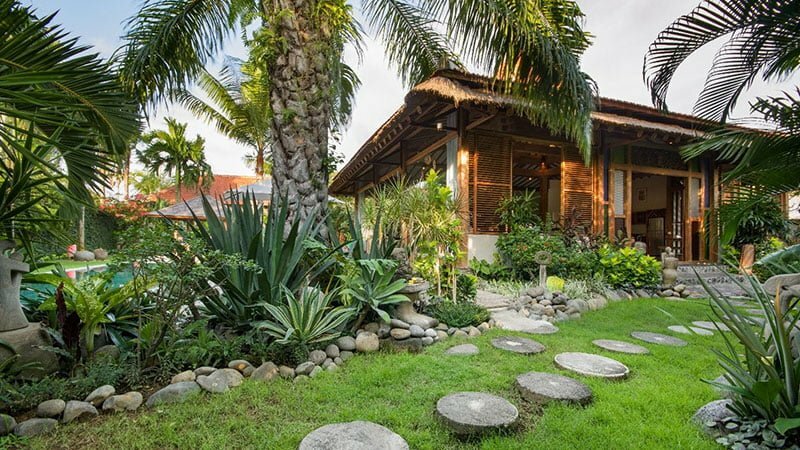 It features an outdoor landscape with natural tropical vegetation and foliage that lends it a wild, beautiful look. 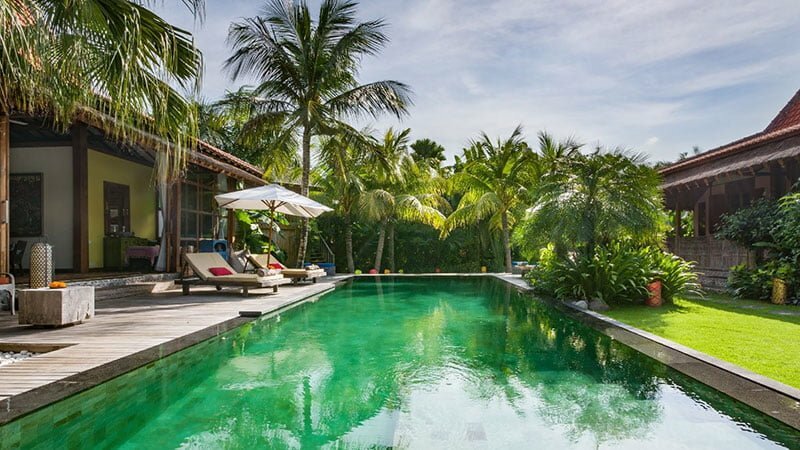 Villa Desa Roro is the ideal place for luxurious relaxation with its large saltwater swimming pool. 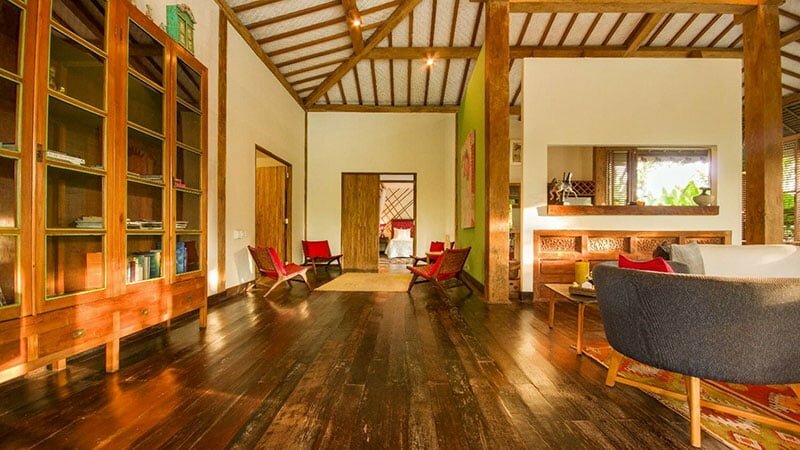 It also has a yoga studio where you can engage in private yoga lessons. 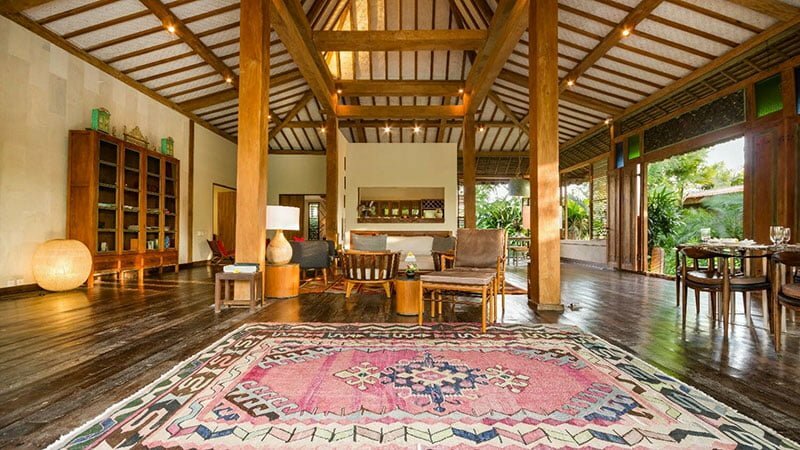 The Villa’s location near Berawa beach offers you the convenience of touring Canggu on foot or by bicycle. 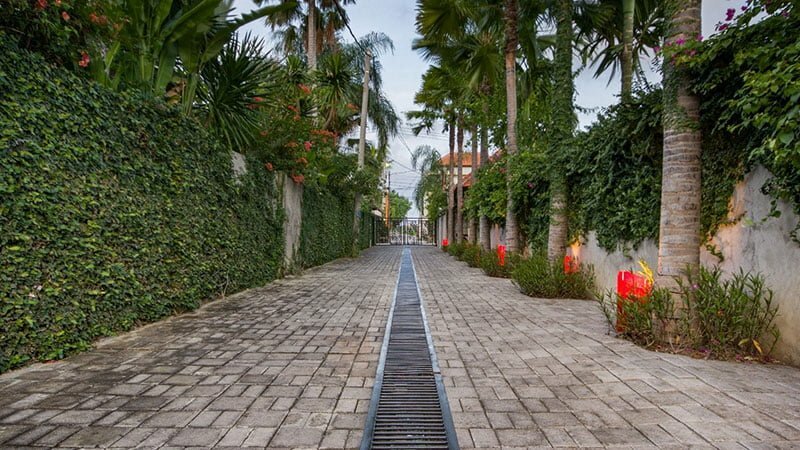 The quiet and serene area is ideal for long beach walks. 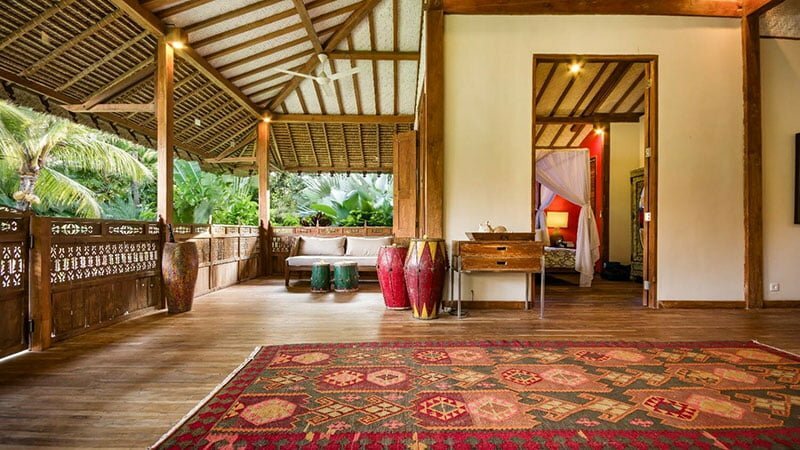 You can visit the expansive rice fields and learn more about Balinese traditional culture. 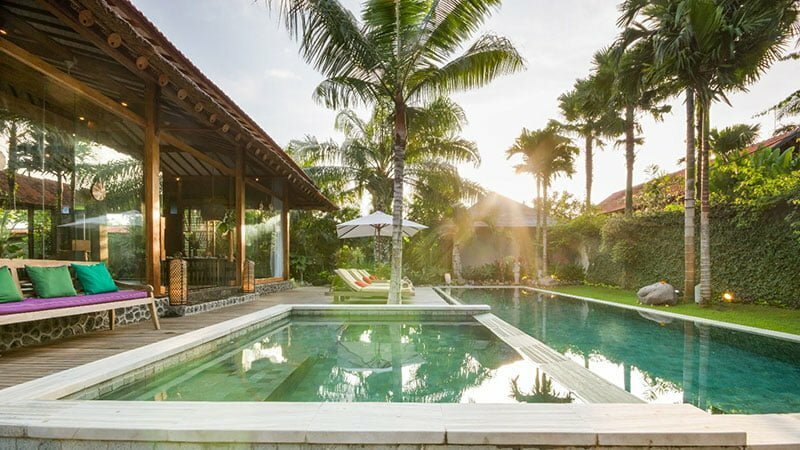 The hip areas of Canggu are a short drive away where you can access beach clubs, shops, surfing spots, and the Echo beach. 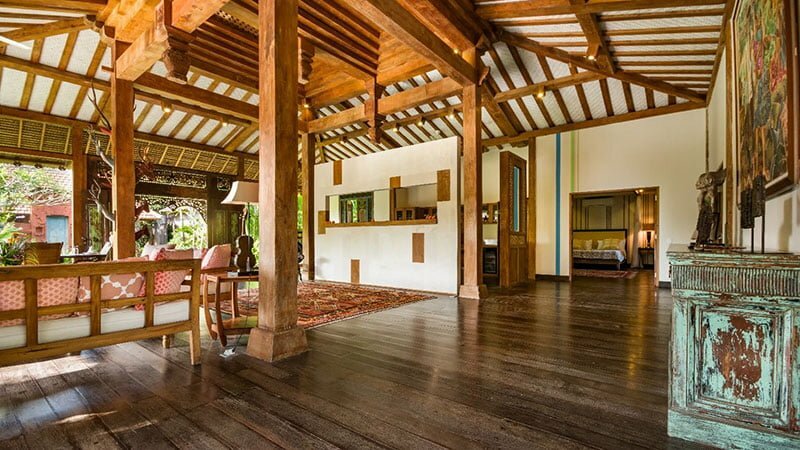 Villa Desa Roro boasts of five separate pavilions designed with gladak roofs. 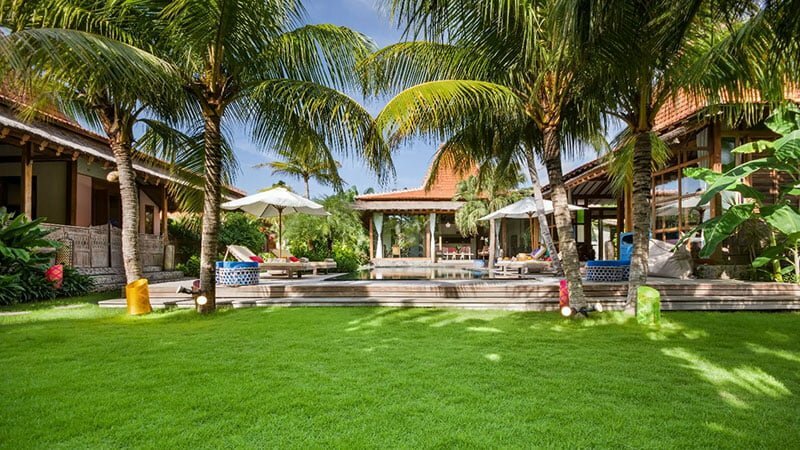 The villa’s pristine and well-maintained gardens are structured around the pavilions. 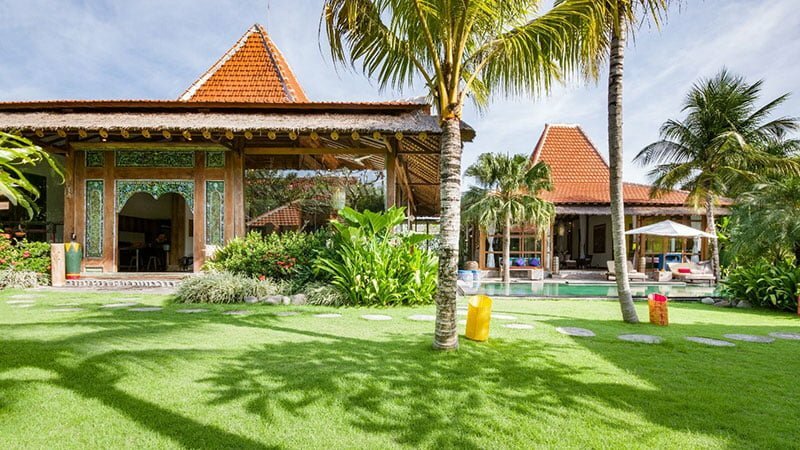 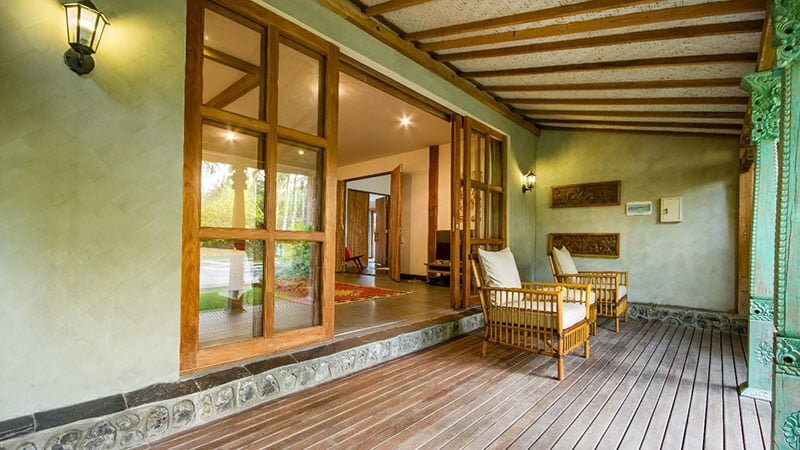 This layout allows you to access the tropical outdoors from different areas of the villa. 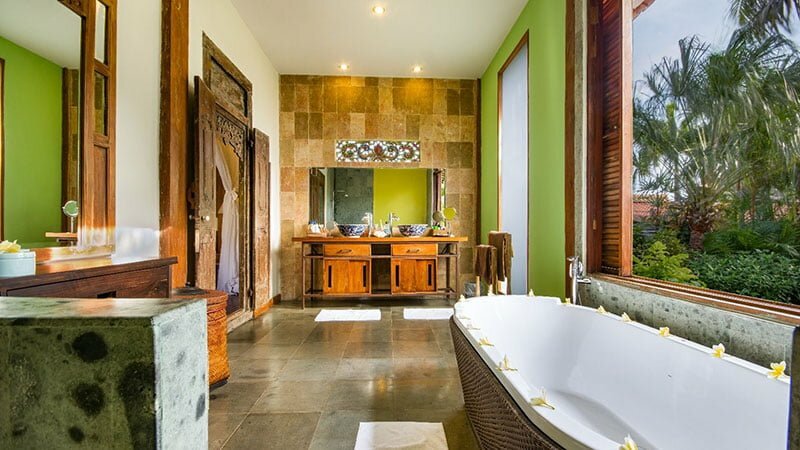 In the middle of all this natural beauty lies a 12-meter salt water swimming pool to offer respite from the Bali sun. 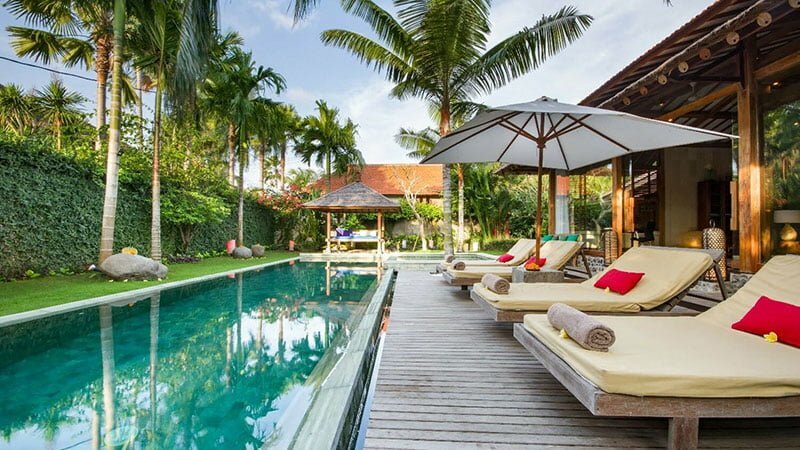 Sun chairs are positioned alongside the pool where you can lounge while enjoying your drinks or reading a book after a refreshing dip. 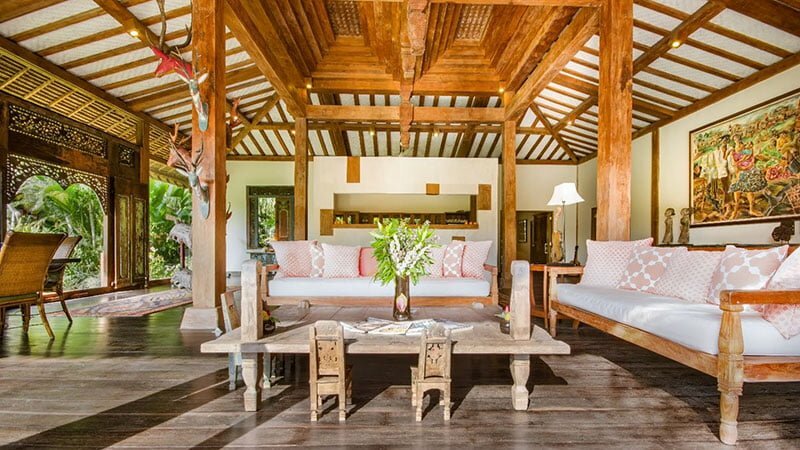 The villa’s main living pavilion is an open-plan Joglo with exquisite décor. 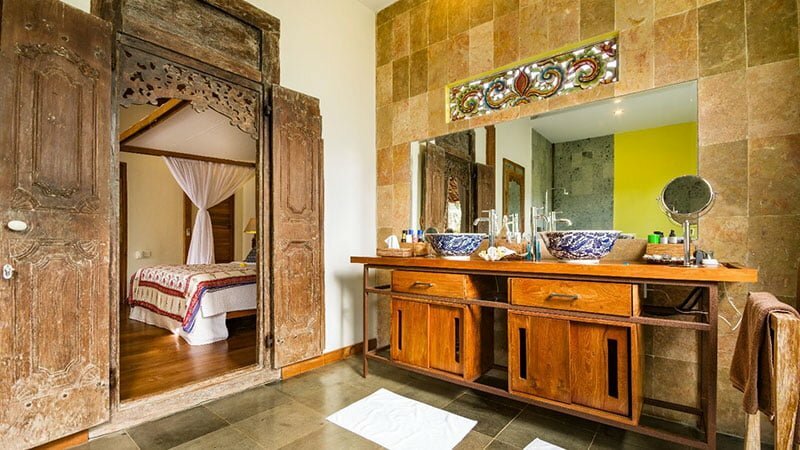 The décor incorporates Indonesian paintings, interesting artefacts, and beautiful sculptures. 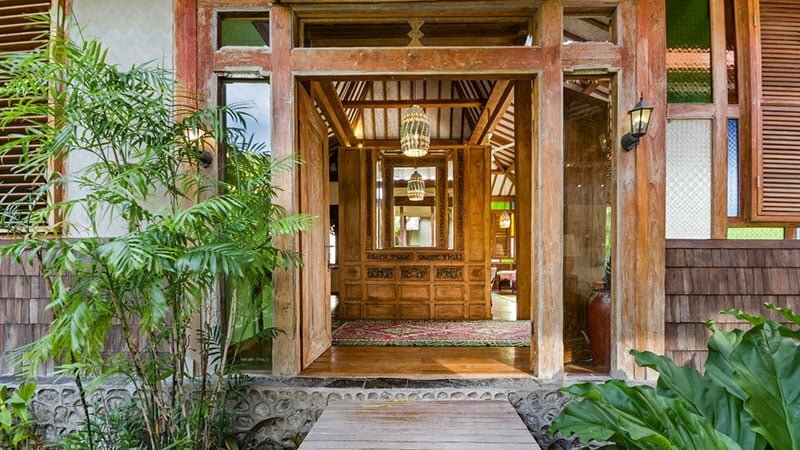 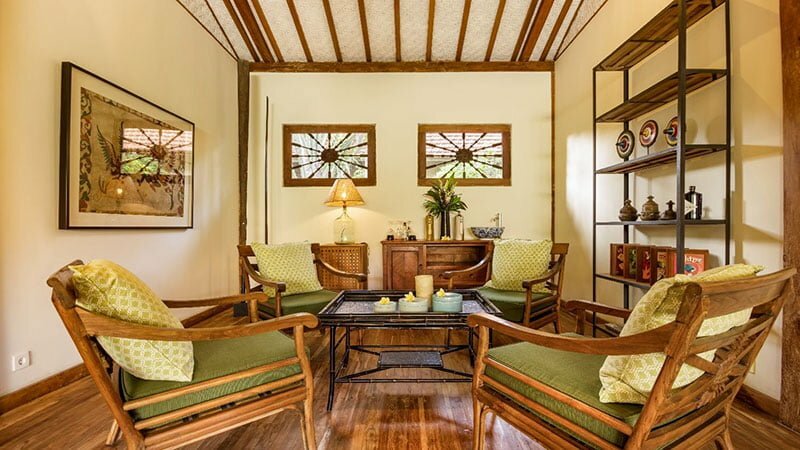 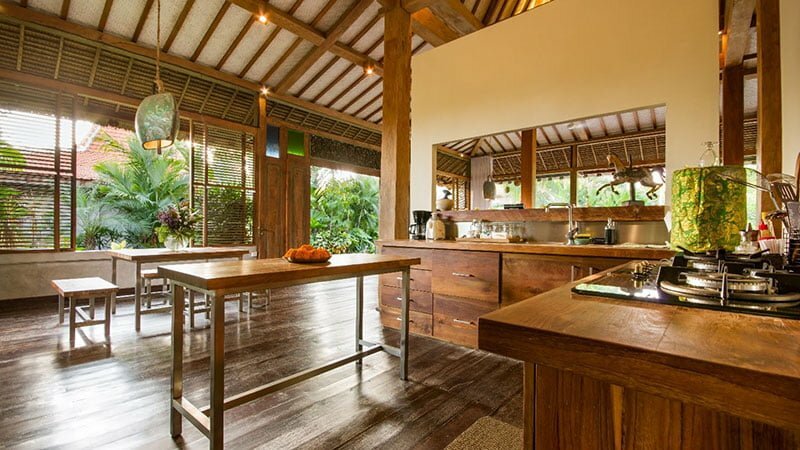 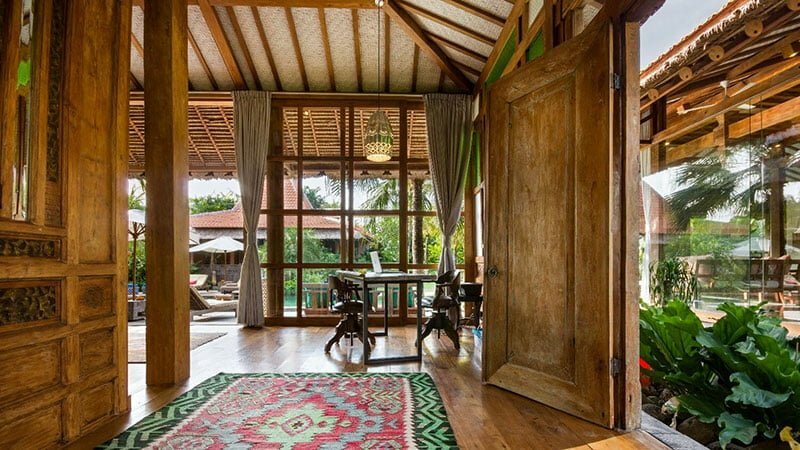 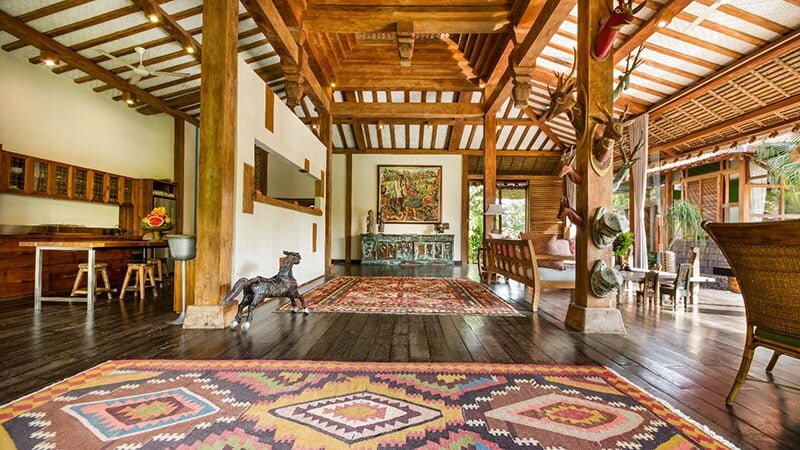 It has all the markings and feel of an authentic Balinese home. 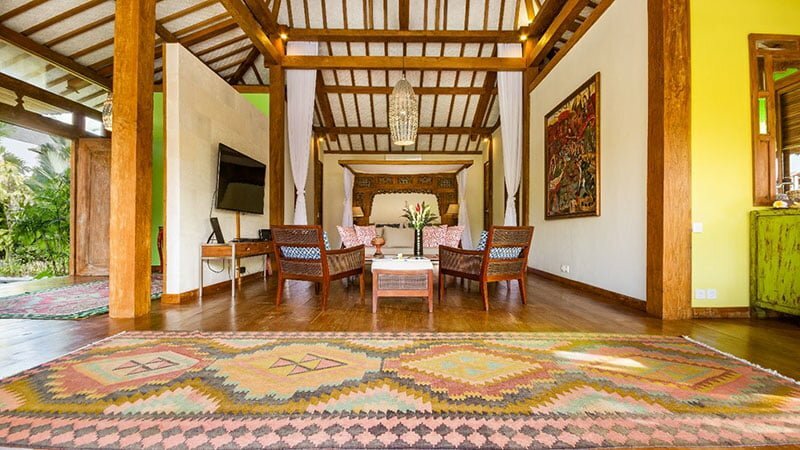 The Joglo has comfortable sofas where you can kick back after a tiring day. 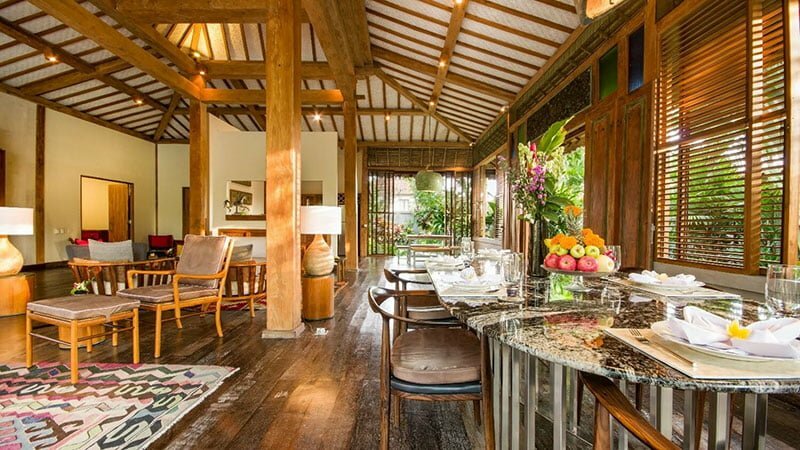 The dining area serves six people and features a teak wood dining table with rattan chairs. 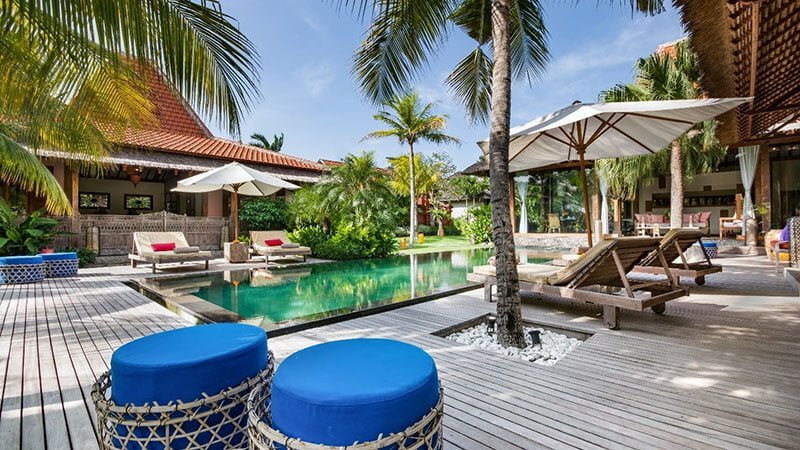 The open-plan design provides you with great views of all the outdoor spaces from the comfort of the villa. 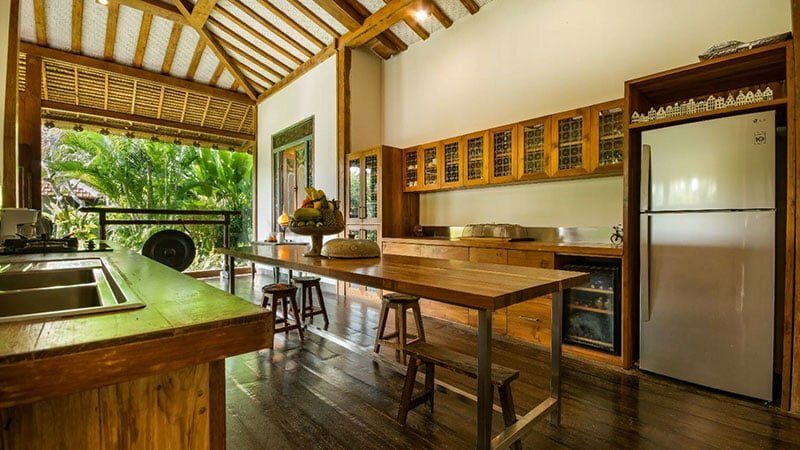 Guest can access a fully equipped kitchen where you can prepare delicious meals. 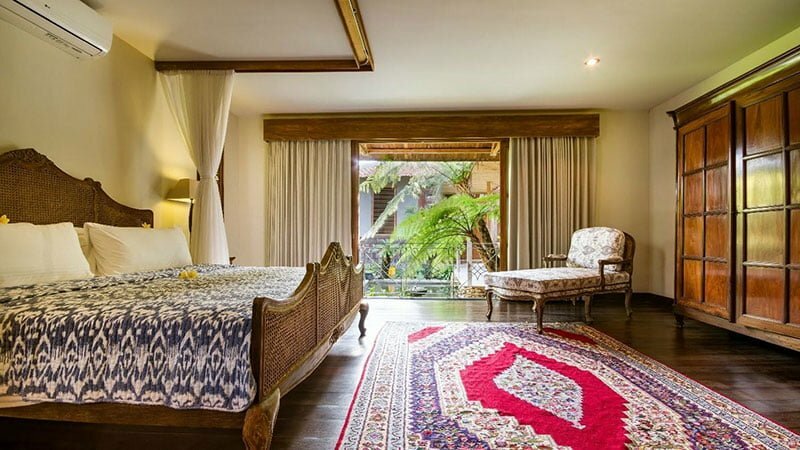 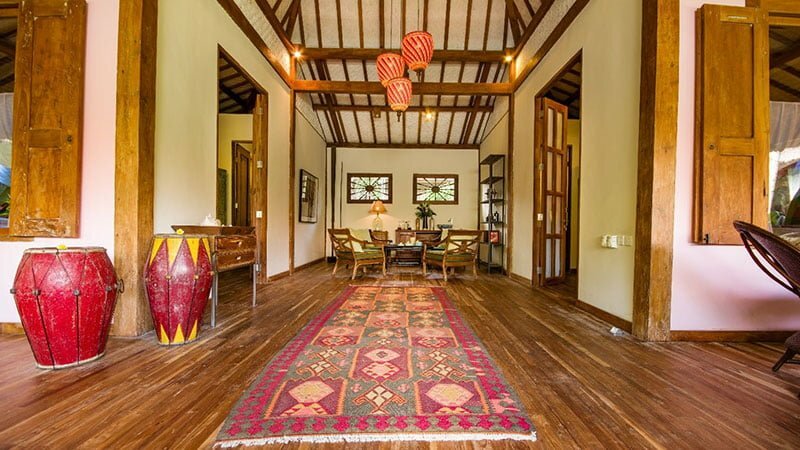 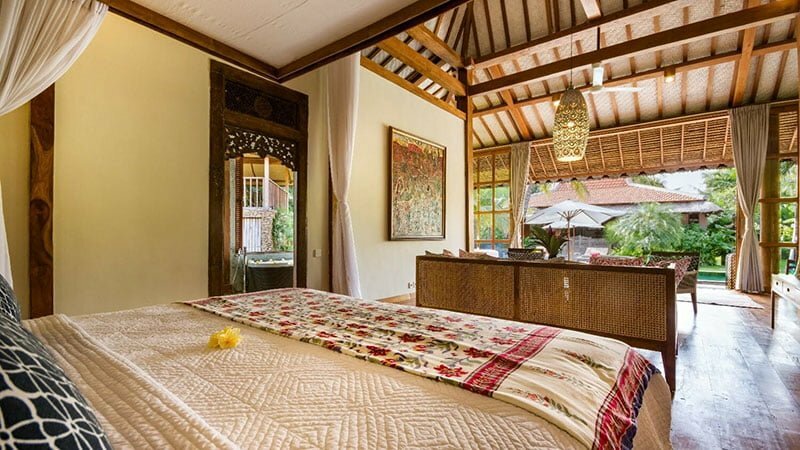 The five bedrooms in Villa Desa Roro occupy three pavilions that don a traditional Balinese design complete with handcrafted woodwork and vibrant colors. 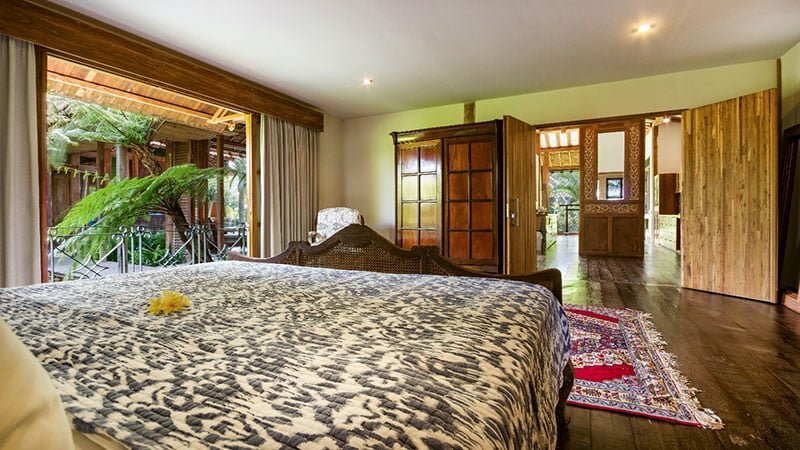 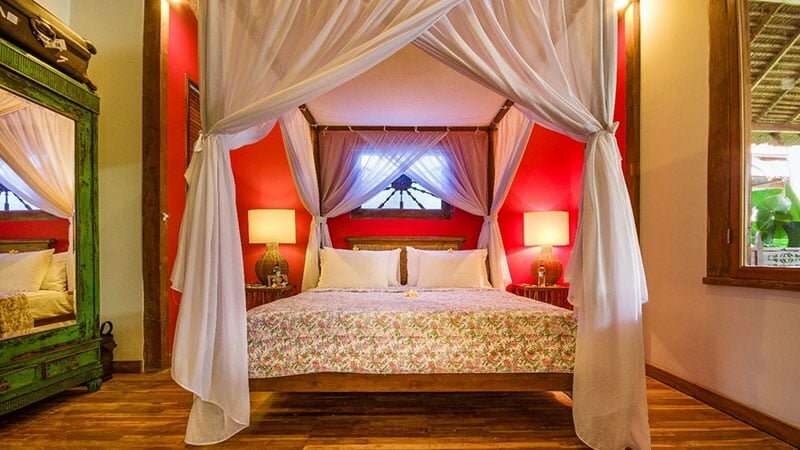 The master bedroom is situated in its own private pavilion. 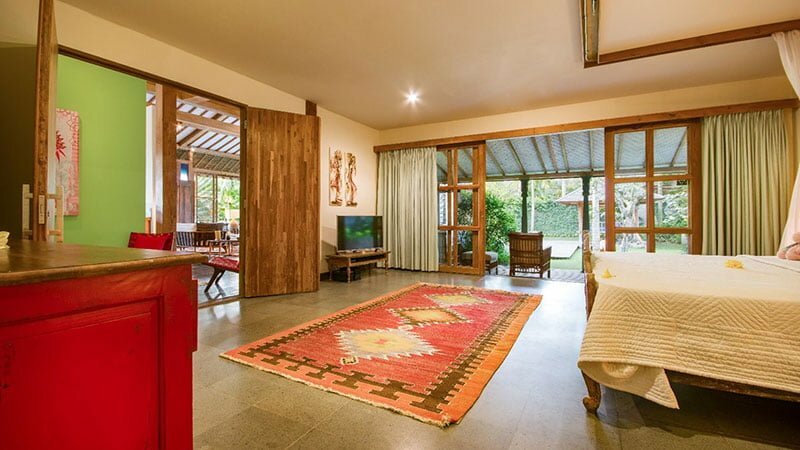 The other two pavilions house four bedrooms. 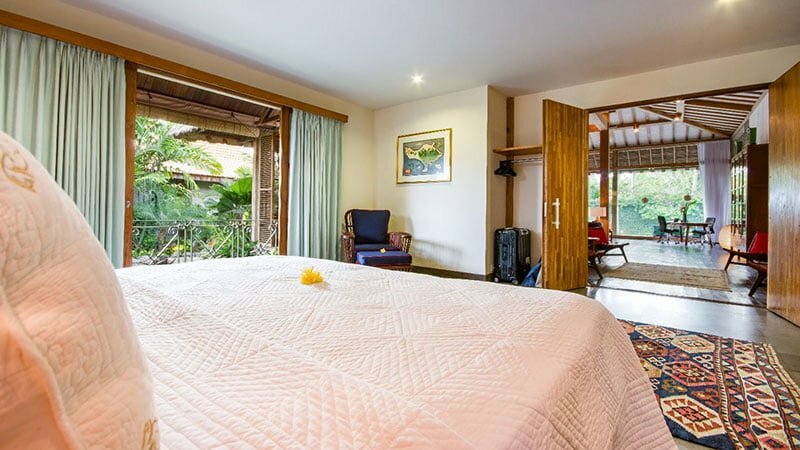 You can access the well-maintained villa gardens and the swimming pool directly from all the bedrooms. 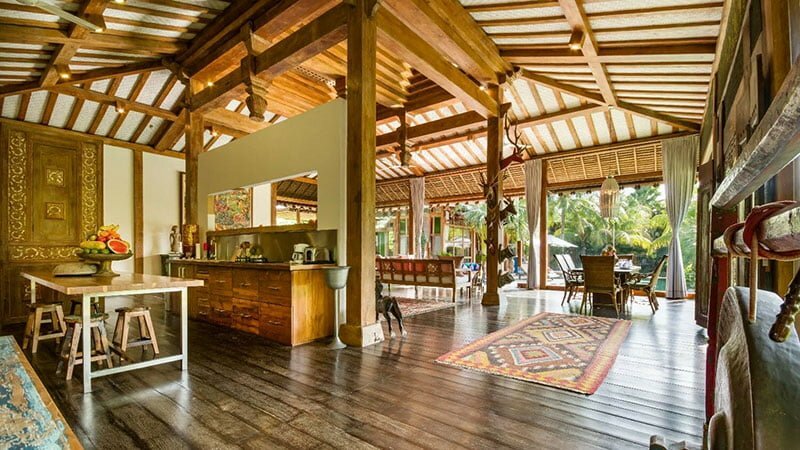 The pavilions are well spaced to allow for easy movement. 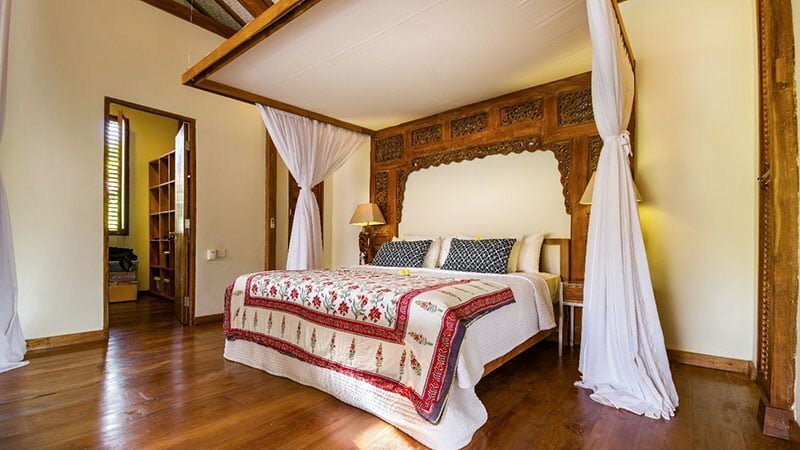 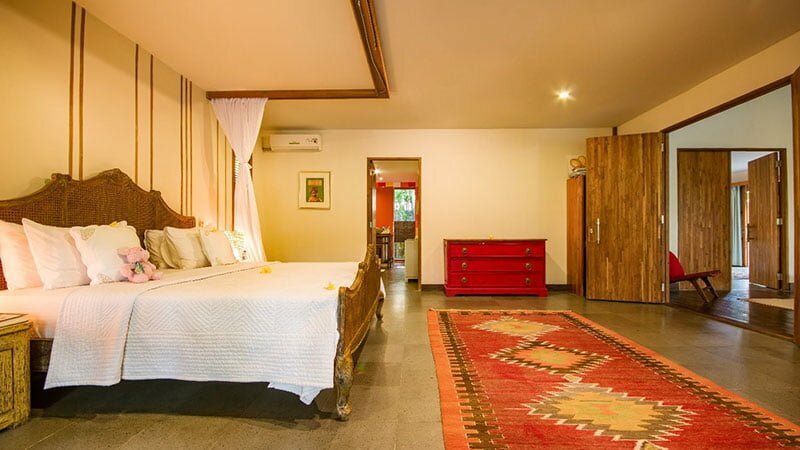 All the bedrooms are en-suite air-conditioned and have canopied king-sized beds. 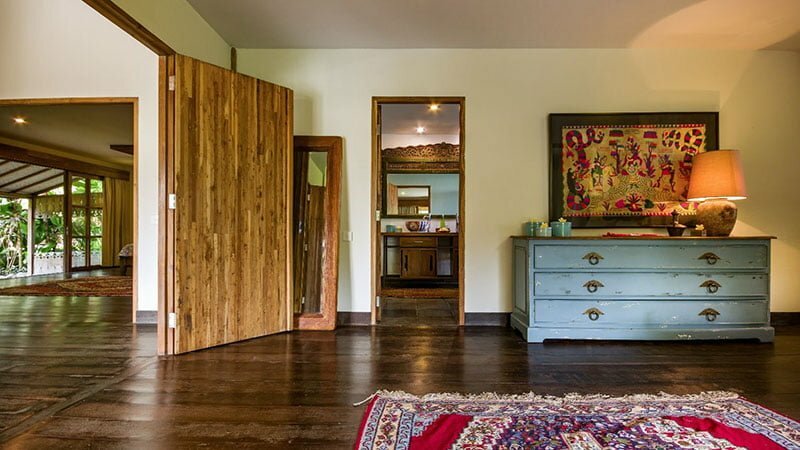 The bedroom décor features high-vaulted ceilings and Asian rugs on the hardwood floors. 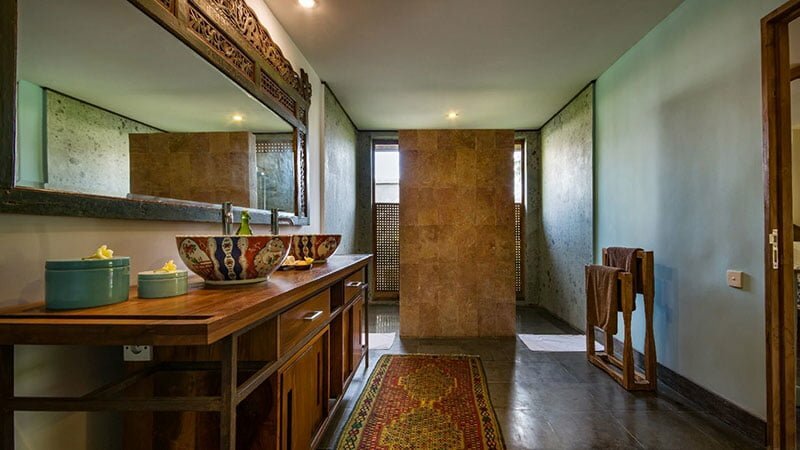 Two bedrooms share a private terrace while the other two share a living area with dining and games. 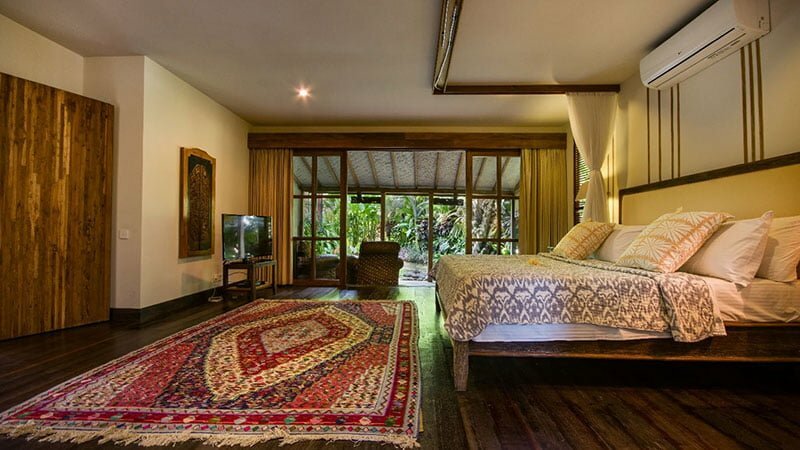 The staff members at Villa Desa Roro are friendly and professional. 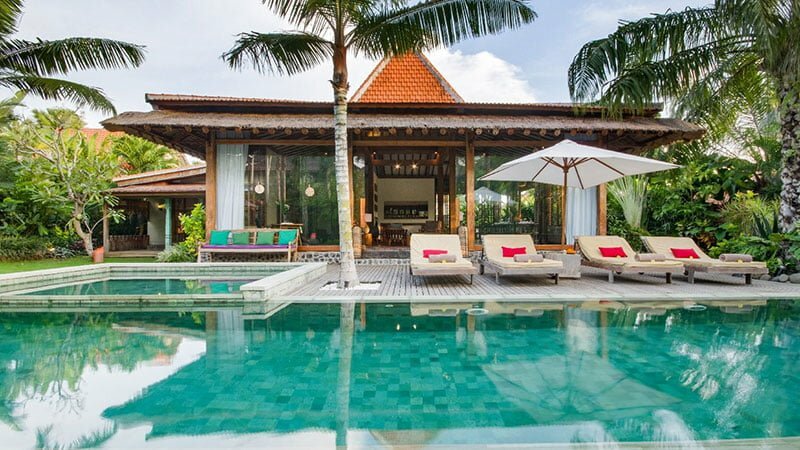 They are dedicated to ensure your stay at the holiday home enjoyable. 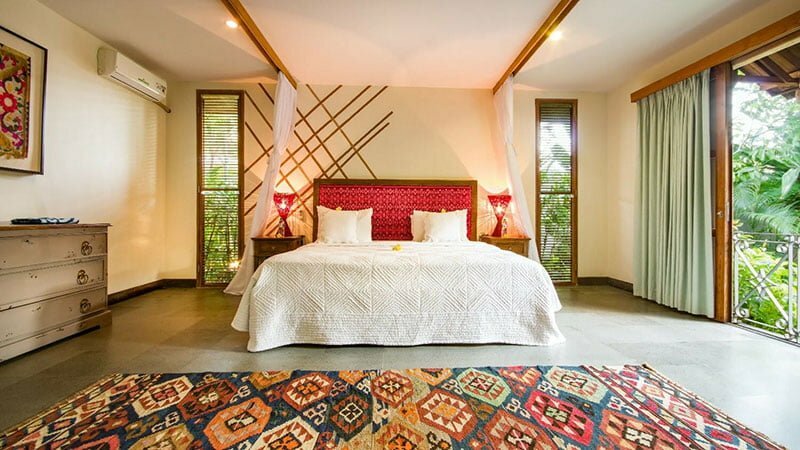 They are always ready to take care of any needs you may have. 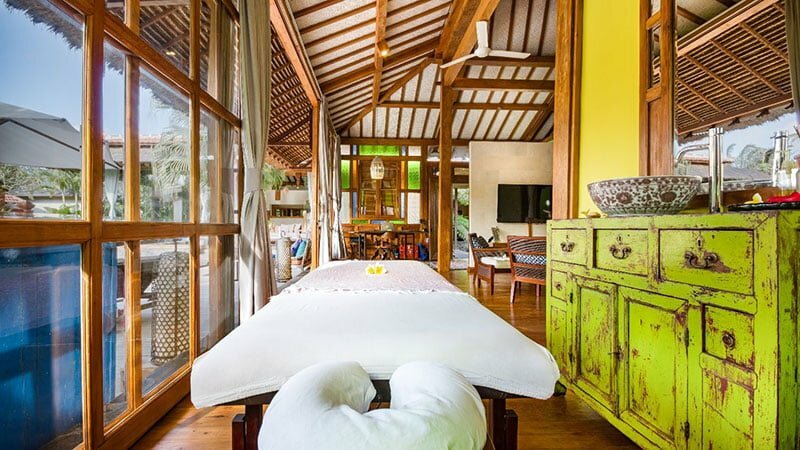 The staff can arrange private yoga sessions at the villa’s mini yoga studio upon request.